Sebastien Loeb's bid for an eighth Monte Carlo Rally win hit trouble after his car sustained suspension damage in a collision with a rock on Friday. The nine-time world champion, who led overnight, lost six minutes after the accident on the day's final run. "We were aggressive, we had to be," said Loeb, who retired at the end of 2012 but is making a one-off appearance for Citoren at the season-opener. Volkswagen's Sebastien Ogier now leads the way by nearly two minutes. 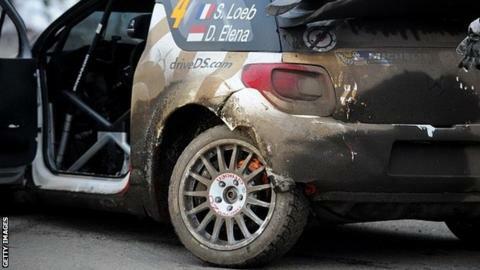 "It happened when I hit a rock in an icy place," added Loeb, who will resume on Saturday in 10th place. "It was not too hard, but it broke something. I had to try really hard because I knew with the conditions it was impossible in this road position, so I tried really hard with a different tyre choice and made a mistake." Two-time defending champion Ogier trailed his fellow Frenchman by 41 seconds before the accident, and now enjoys a 1min 45.4sec cushion to team-mate Jari-Matti Latvala with two days of racing left. The Citroen of Ireland's Kris Meeke also saw his hopes of a podium finish ended by a damaged suspension. Former Formula 1 driver Robert Kubica lost three minutes when he crashed his Ford Fiesta, leaving the car with a damaged front end.